Although I haven’t played a roleplaying game in years, as a kid/teenager I used to absolutely love things like Dungeons & Dragons. I had a fairly large collection of roleplaying games and related books that I liked to look through. I don’t believe I ever actually played Star Wars: The Role Playing Game, but I do still have a number of the books. I never really thought metal miniatures were necessary for roleplaying games, since in most cases the action took place entirely in our imaginations, but it’s cool to have 3D representations of some of the characters. And having also played tabletop wargames like Warhammer, I’m quite familiar with miniatures like these. I’ve painted hundreds of them over the years. 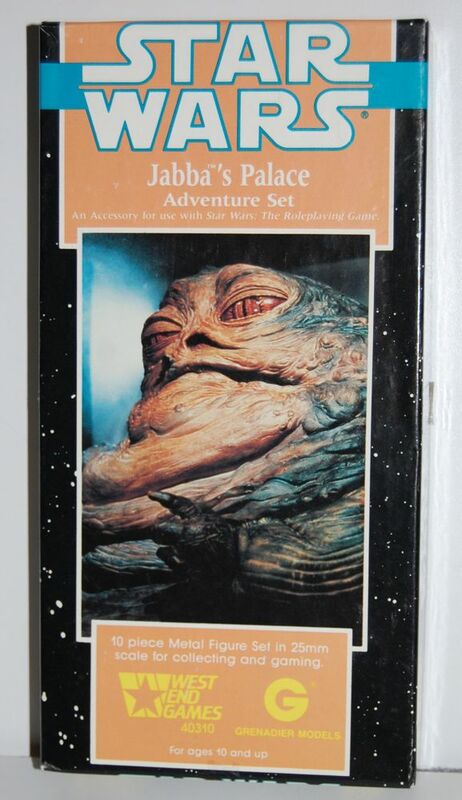 In fact, I have already posted about the Jabba that I painted from this set, but for some reason I never got around to posting about the entire set. 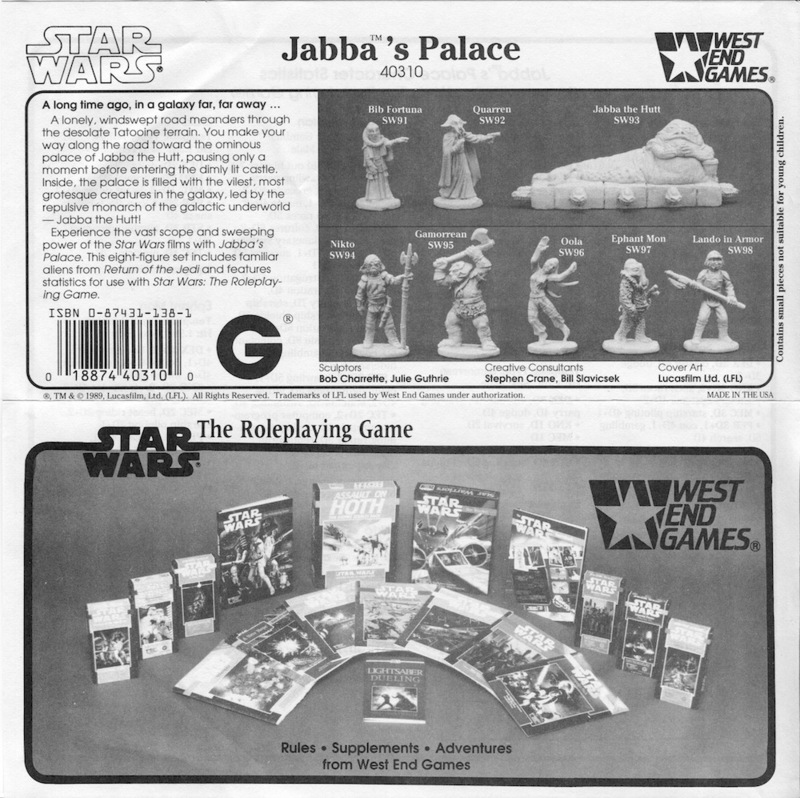 These particular miniatures were released by West End Games in 1989 as a supplement to their Star Wars roleplaying game. They definitely remind me of the miniatures that were made for Dungeons & Dragons. These are smaller and less exaggerated in their sculpting than the ones put out by Citadel Miniatures for use in Warhammer. The set comes with 8 miniatures: Jabba the Hutt on his throne, Bib Fortuna, a Quarren, a Nikto guard, a Gamorrean Guard, Oola, Lando in Armor and “Ephant Mon” (who is actually a mislabeled J’Quille/Tooth Face, and not Ephant Mon at all). 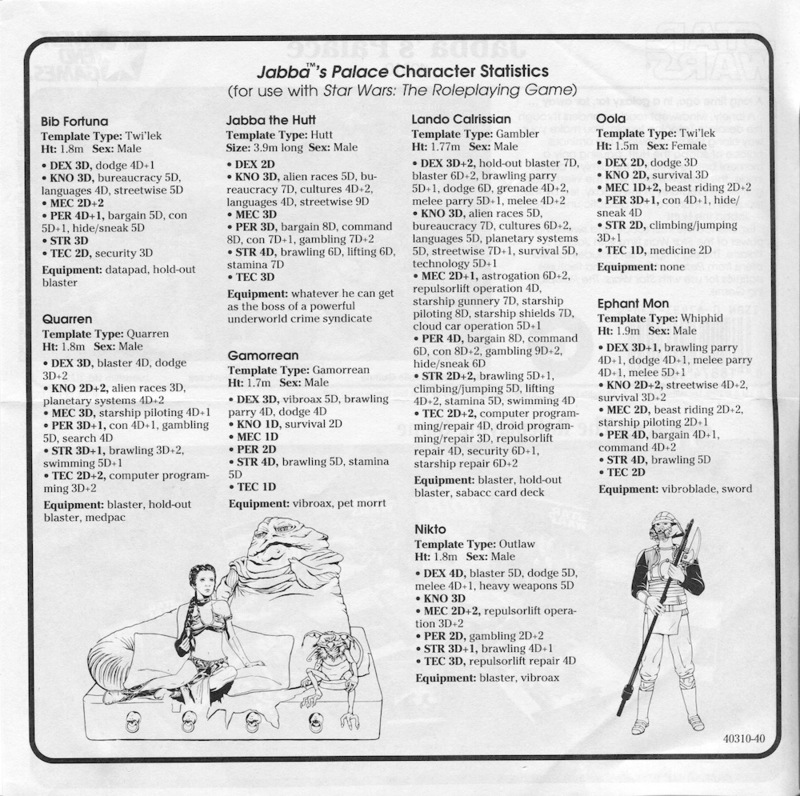 Here is the included insert, which has the stats for use in the roleplaying game on the reverse side. For what it’s worth, the WEG Star Wars RPG was very good. It’s a light, streamlined system better suited to fast moving space opera than the D&D system is. And those are very nice minis. West End Games really had their act together back then. Yep, I should’ve mentioned it. 🙂 Thanks to you, I have an unpainted version to display with the rest of the figures.